Every homeowner needs a well-stocked tool arsenal for making home repairs and maintaining lawns and gardens. 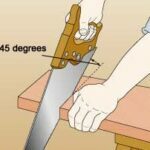 The number and types of tools you’ll need varies, depending on the age and condition of the home, the size of the property and your skill level. However, regardless of whether you’re a novice do-it-yourselfer or professional contractor, it’s not practical—or even possible—to own every tool you’re ever going to need. 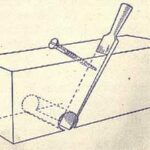 For example, you may only need a tool for a short period of time or for a very specific purpose. Plus, certain jobs might require an expensive machine or specialized piece of equipment. In those cases, it makes much more sense to rent a tool rather than buy it. 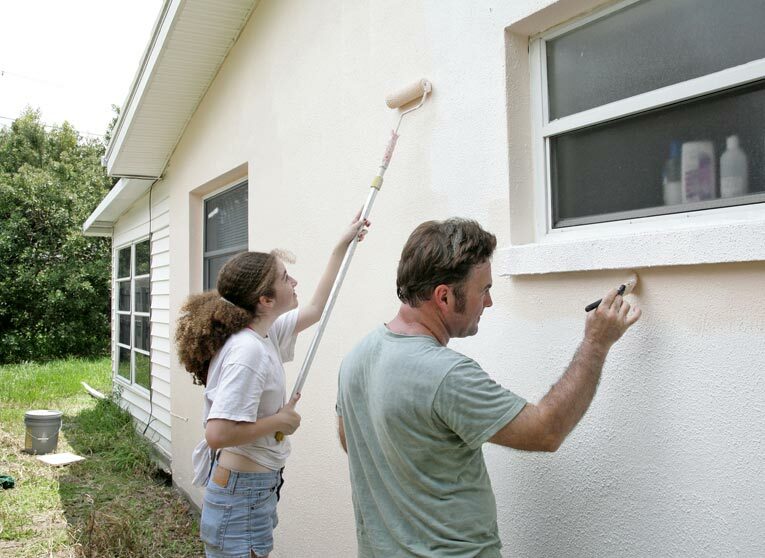 Listed below are 10 of the most useful DIY rental tools, which are available at most home improvement centers. Power auger digs post holes quickly. If you’ve got two or three holes to dig, a shovel or manual posthole digger will suffice. But what if you’re installing a new fence or deck and have to excavate 20 or 30 holes? Save yourself a ton of time and trouble and rent a gas-powered auger, which resembles a giant corkscrew. The one-person auger shown above can dig an 8-inch-diameter by 30-inch-deep hole in 60 seconds. It rents for about $75 per day. Tool Rental Tip: To dig really large, deep holes, rent a two-person auger. It can dig holes up to 18 in. in diameter and 48 in. deep. Tile saw make quick work of cutting ceramic tile. Tiling used to be the exclusive domain of professional tile contractors. But with the widespread availability of tiling tools, materials and instructions, more and more homeowners are tackling tiling projects like kitchen backsplashes, bathroom floors and countertops. However, to achieve professional results, you must cut the tile accurately and cleanly. The best tool for that is a motorized wet saw. 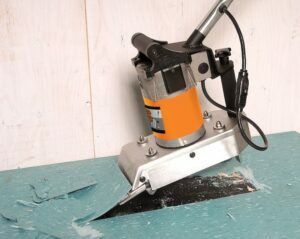 The saw uses a diamond-grit abrasive blade and water bath to smoothly slice through the toughest tiles, including granite, porcelain and glass. The model shown here cuts tiles up to 14 in. sq. and rents for about $49 per day. Tool Rental Tip: Install full-size tiles first, and then rent the wet saw to cut the remaining tiles to fit. That will reduce the rental time and save you a little money. Demolition hammer does a great job of breaking up a concrete slab. An electric demolition hammer looks and works a bit like a mini-jackhammer. 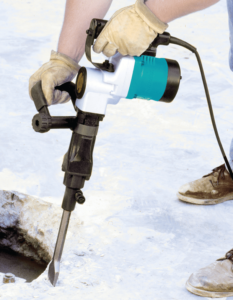 Its rapid-fire hardened-steel bit quickly blasts through poured concrete, brick, stone and tiled surfaces. Grasp the tool with both hands to prevent it from bouncing off course, and be sure to wear tight-fitting safety goggles as protection against flying debris. The demolition hammer and its larger cousin, the breaker, come in various sizes, but the medium-duty tool shown here is sufficient for most DIY jobs and rents for about $60 per day. Tool Rental Tip: Need to remove a boulder from your lawn or garden? Don’t bother digging it out. Use a demolition hammer to break it up into small pieces. Walk-behind leaf blower hastens yard cleanup. If you love raking leaves, skip ahead. 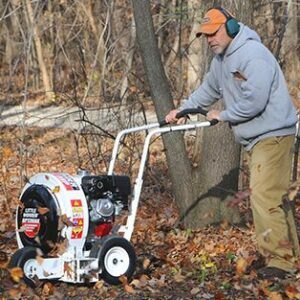 For all others, consider renting a walk-behind leaf blower to clear leaves, twigs and grass clippings from your lawn. This gas-powered machine produces hurricane-force winds between 160 and 180 mph to blast away even the most stubborn lawn debris, including wet, matted leaves. It’s also great for removing standing water from driveways, patios and other large, flat surfaces. Walk-behind leaf blowers typically rent for about $63 per day. Smaller backpack and handheld blowers are also available for rent. Tool Rental Tip: Walk-behind blowers are available in both push-style and self-propelled versions. The push type is fine for small, flat yards, but if your property is hilly or expansive, rent a self-propelled model. 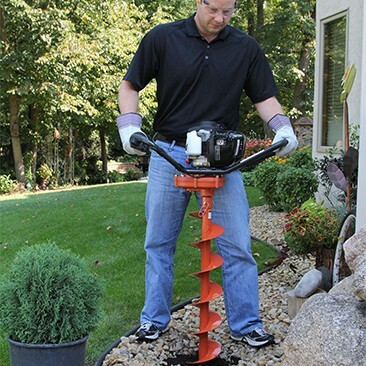 Power drain auger clears clogs and blockages from drain pipes. You can save a considerable amount of money by clearing common plumbing clogs yourself. The only problem is that your plumber’s helper—the plunger—is only effective on very small clogs. To clear large obstructions, especially ones located deep inside a pipe, rent a portable drain cleaner. This easy-to-use tool consists of a 35- to 50-foot-long flexible steel cable attached to an electric drill. It’s specifically designed for use on sinks, tubs, showers and other small-diameter drains. When using it, be sure to wear work gloves in leather, not cloth, to protect your hands. Tool Rental Tip: Run the tool in the forward direction when advancing and retrieving the cable. Only shift into reverse if the cable becomes stuck. Orbital floor sander is a must if you intend to finish your own wood floors. Refinishing wood floors to like-new condition is now well within the capability of the average homeowner. 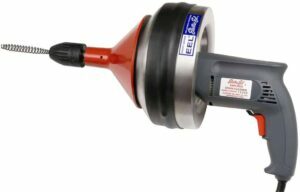 Home-improvement centers rent a wide variety of floor-refinishing machines, including the upright orbital sander shown here. Unlike a drum sander, this vibrating machine is easy to control and maneuver with virtually no risk of damaging the floor. The model shown here can be used on all types of wood floors and is also great for refinishing outdoor decks. It rents for less than $10 per hour. However, you must purchase the abrasives separately. Tool Rental Tip: Before renting a floor sander, confirm that it has a dust-collection system. If necessary, rent an accompanying vacuum, hose and fittings. Power floor stripper furiously removes old resilient flooring. Removing old, glued-down flooring is virtually impossible to do by hand. However, if you rent an electric floor stripper, you’ll be able to scrape up the flooring in an average-size room in about an hour. 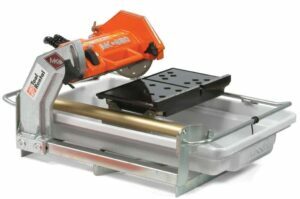 This compact machine has a powerful motor, long handle and wide steel blade that vibrates back and forth at high speed. 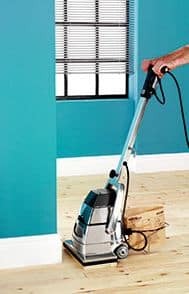 Power floor strippers, which rent for about $10 per hour, can be used to remove vinyl sheets, vinyl tiles, wood parquet, even carpeting and carpet padding. Tool Rental Tip: Be aware that many flooring products manufactured before 1980 contain asbestos, a known carcinogen. If you suspect the flooring contains asbestos, don’t scrape it up. Instead, call a licensed asbestos abatement company. Brush cutter chops through thick grasses and brambles. Tame the wildest, densest, most overgrown property in a matter of minutes with a hydraulic brush cutter. This powerful self-propelled machine plows down and slices through the toughest, thickest underbrush, brambles, berry bushes, tall grasses, weeds, vines and even saplings. 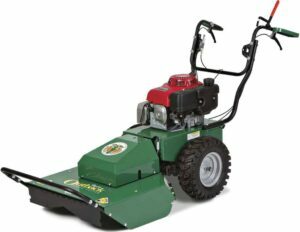 The 26-inch-wide brush cutter shown here is ideal for running across rough terrain and up and down hills. It rents for about $10 per hour. Tool Rental Tip: When determining how long to rent the brush cutter, keep in mind that you should be able to clear about an acre of brush in one hour. Rotary tiller plows the soil for gardening. A rotary tiller is the ideal rental tool because most home gardeners only need it twice a year: once in the spring to loosen the soil prior to planting, and again in the fall to till amendments into the soil. 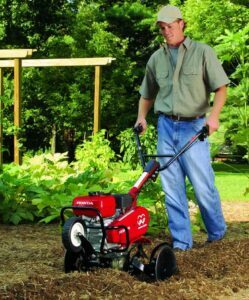 The easy-to-use mid-tine tiller shown here is perfect for small to medium-size gardens and flowerbeds. It rents for $10 to $12 per hour. Tool Rental Tip: Rinse off the tiller before returning it to the rental store. It may not be required, but it’s the considerate thing to do. Pressure washer comes in handy for a variety of do-it-yourself tasks. Pressure washers provide a fast, effective and fun way to clean virtually any outdoor surface, including decks, vinyl or metal siding, fences, patios, cars, trucks, RVs and boats. 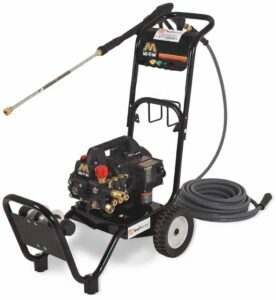 Rental stores carry both electric and gas-powered pressure washers. Electric models, like the one shown here, are lightweight, easy to use and highly maneuverable; they’re ideal for small, light-duty jobs and rent for $40 per day. For medium- to heavy-duty cleaning chores, rent a gas-powered pressure washer. Note that these are powerful machines that can damage surfaces and harm people if not used improperly. Ask the rental associate for detailed safety instructions. Tool Rental Tip: When renting a pressure washer, be sure to also buy a jug of detergent or degreaser, which you can add to the machine’s reservoir for superior cleaning power. Note that this list represents only a small fraction of the items available. From bolt cutters to backhoes, if you need it, it’s probably available for rent by the hour, day, week or month. Joe Truini is a home improvement expert who writes about a variety of topics related to carpentry and plumbing. Joe is also the author of numerous DIY books, including the best-selling Building a Shed. 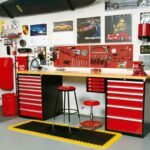 Please visit his Tool Rentals Guide to learn more about renting a wide range of tools.